TOPS is committed to making it easy for you to get every healthy thing you need in one quick stop. > Easy to transfer your prescriptions! Just bring your current prescription bottles right to the Pharmacy. From vitamins and cough medicine to shampoo and conditioner, you'll find everything you need to get well, stay well and live well right here! At TOPS Pharmacy, we believe that better health means affordable care. > Earn GasPoints® on your eligible prescription purchases at participating TOPS Pharmacies! *Certain prescriptions excluded by law. See pharmacist for details. We're dedicated to providing superior prescription services and quality	pharmaceutical care. 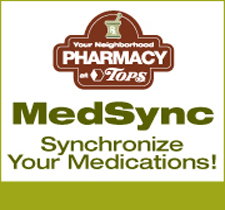 TOPS MedSync synchronizes all of your medications to be available on the same day each month. Just ask your TOPS Pharmacist to enroll. * Promise applies to orders of two (2) prescriptions or less dropped off in person at the pharmacy. Promise does not apply to : prescription compounds, prescriptions called in, prescriptions via electronic message, flu shots, prescriptions requiring a call to a doctor or insurance company, prescriptions transferred in from another pharmacy or prescription dropped off during meal breaks. Looking to Renew Your NYS Driver's License? Did you know TOPS Pharmacists are now authorized to administer the Department of Motor Vehicles' Vision tests to you? Now you no longer have to visit the DMV offices and wait in line; you can get your vision tested and grocery shop in one easy trip! Stop in to any TOPS pharmacy location and talk to a Pharmacist today! 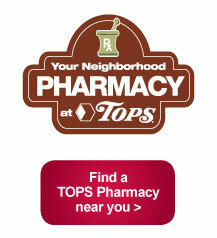 Click here to find a TOPS Pharmacy near you. Request prescription refills 24 hours a day, 7 days a week. Follow the easy prompts to request prescription refill. Choose your pick up time. Telephone Easy-Fill still gives you the option to speak directly with your TOPS Pharmacist during regular business hours. The notice below describes how medical information or health information about you may be used and disclosed, and how you can access this information. Please review it carefully.